Business cards form an important constituent of any business irrespective of its size. While large business setup can afford professional services for customized business cards for unique identity, same it not true for small business owners. 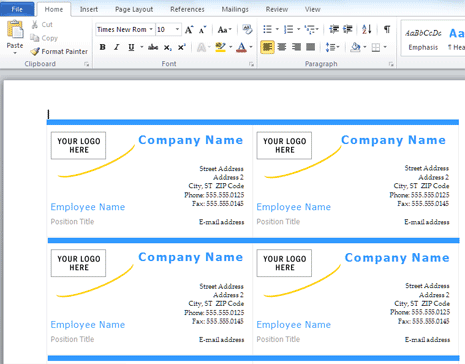 However, even small business owners can create customized printable business cards quickly without any professional help in Microsoft Word 2010 program. 2. 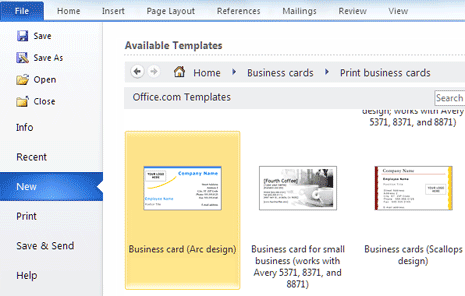 Under ‘Office.com templates’ click ‘Business Cards’ option. 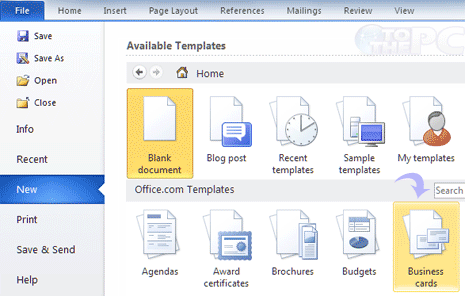 Make sure you have active internet connection, as Word program will download business card template preview from office.com website. 3. On the next screen click ‘print business cards’ option to view stylish templates for business cards. 4. You can scroll down to browse available business card templates. Then double click on specific template to download it for use. 5. Template should download quickly (in few seconds, you will hardly notice). Then you can customize the business card layout with own text like name, phone number, business tagline and so on. 6. Once you are done with customization, goto File > Print for printing the business card on paper. If you prefer online business cards, then checkout various online tools to make digital business cards in few simple clicks.